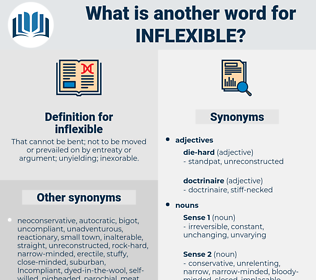 What is another word for inflexible? That cannot be bent; not to be moved or prevailed on by entreaty or argument; unyielding; inexorable. stiff, unshakeable, stringent, immovable, agile, rigorous, adaptable. uncompromising, intransigent, unbending, unwieldy, stiffness, adamant, tough, ossified, cumbersome, strict, entrenched, harsh. pliable, cooperative, soft, yielding, elastic, resilient, amenable, submissive, easy-going, pliant, bendable. remiss, undecided, spoiling, neglectful, willing, responsive, gentle, lenient, accepting, mutable, fluctuating, slovenly, acquiescent, uncertain, agreeable, persuadable, unstable, fickle, reasonable, subservient, dutiful, tolerant, varying, slavish, mild, semisoft, inconstant, irresolute, sloppy, teachable, governable, pampering, temperate, placable, workable, merciful, wavering, unsettled, kindly, complying, receptive, slipshod, negligent, complaisant. Calls me proud and inflexible in this breath!
" I am coming to bed," repeated the deceased lady, inflexible as ever in carrying out her will.